Among other teams to take road trips out west, Brooklyn and Charlotte each had a rough go of it in Week 3 (and in Week 2). They went a combined 1-7, including 1-5 last week with the only win between the two coming from Charlotte over Phoenix on Friday night. The West’s struggles largely came from Utah and Oklahoma City, together going 1-5 including the latter team losing to Detroit on Friday. Taking out Dallas’ victory, the West had a point differential of just 1.22 over the other 18 games and a Pythagorean record of 9.8-8.2. Kind of amazing what a difference one game can make. Over the course of an entire season, I’d like to believe enormous victories are balanced out with the occasional “upset”. Even if we’re taking into account point differentials of multiple teams versus just one. Week 4 brings 21 non-conference games with the West being repped in 10 of those by Phoenix, the Clippers, and San Antonio. Dallas, Portland, and Memphis take up six more games. Boston and Chicago have three games each for the East while Brooklyn, Cleveland and, um, Philadelphia play West foes twice. 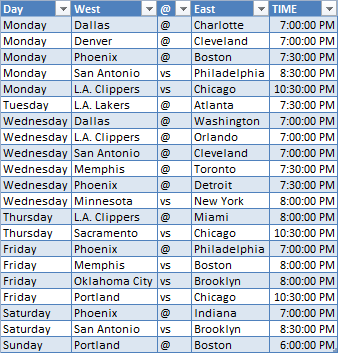 The East has a 13-8 edge in home/away games, so maybe that’s enough to prevent a solid week for the West.